Be curious! Be imaginative! Be determined! Develop your talents by drawing inspiration from the greatest of geniuses. In a world that changes quickly, the future belongs to those who have an open, flexible mind: like John Lennon, they will imagine the impossible; like Walt Disney, they will work as a team; and like Copernicus, they will be able to think backwards! If you’re worried you might not be up to the job, have no fear! This fascinating book will show you the way. Meet 27 geniuses from different eras and disciplines – artists, scientists, thinkers or writers – and learn from their "creative methods". 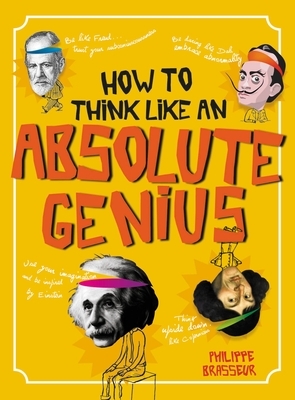 Packed with facts, games and activity ideas to boost your intelligence, creative, inventive, and critical thinking skills, this book will show you that you can become absolutely awesome at whatever you put your mind to! Philippe Brasseur is a "cultivator of ideas". After a career in advertising, organizing events and youth publishing, since 2002 he has been a consultant and trainer in creativity and mental flexibility. He has written and illustrated several books on creativity (most recently Genie Toi-meme!, Casterman), as well as children's books. He opened the "Creativita" center near Brussels, where he lives with his wife and their 4 children.